The number of calories in a glass of red wine depends on how much is poured. 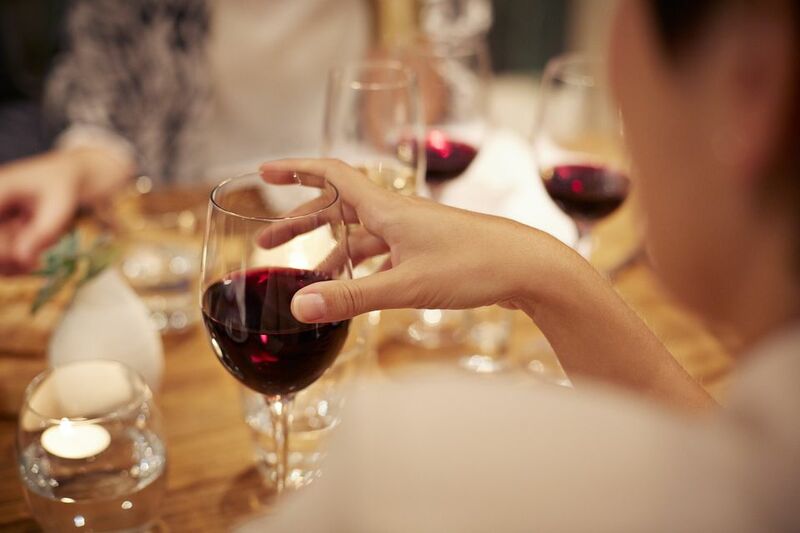 You can figure approximately 25 calories per ounce of red wine. A typical restaurant pour of red is five ounces, which matches the U.S. standard drink size for health and safety risks. Despite potential red wine health benefits, four ounces is considered the standard serving size in many weight loss diets. That is a mere half cup of wine, measured and then poured. You may be surprised at what a four-ounce pour looks like in a large-rimmed red wine glass, and you might be pouring far more at home. Your five-ounce (147-milliliter) glass of red wine at a typical restaurant tops out at 125 calories. The standard "diet-friendly" glass of red wine that only weighs in at four ounces and 100 calories isn't too bad. To keep the calorie count accurate, you must measure. Fill that wine glass to the rim and you may have double the calories. There are 25.4 ounces (750 milliliters) in the average bottle of wine. Since one ounce of dry red wine or white wine has about 25 calories, one full bottle of wine contains about 635 calories. While there is some variability among varietals and wine styles, there is little caloric difference between red wine and white wine. Wines with higher alcohol content have more calories than wines with lower alcohol content, which have more carbs or sugar by volume. That’s because one gram of alcohol has seven calories compared to one gram of carbohydrate, which has four calories. For example, a six-ounce glass of wine that has an ABV of 15 percent has about 144 calories compared to a six-ounce glass of wine that has an ABV of 12 percent, which has about 115 calories. Will Wine Make You Fat? Wine is fat-free, but it can be fattening as it contributes to your daily calorie intake while providing little in the way of nutrition. The calories in wine come from both sugar and alcohol. Limiting alcohol to moderate consumption (one drink per day or less) is important for safety and health, and the same rule applies for caloric reasons. Wine has calories, just like anything else you love to eat or drink, and those calories can add up quickly when you’re not paying attention to them. Liquid calories tend to be easier to ignore than food calories because they don’t necessarily feel the same way going down. If you aren’t careful, you can consume as many calories drinking wine as you would eating a giant slice of chocolate cake. To many, a life without wine is an unpleasant thought. By making the right choices, you can keep the calories down and enjoy a small glass of wine as fits into your diet plan.